Buy it, it’s a bargain. After many, many years there is now an officially released Tank DVD. 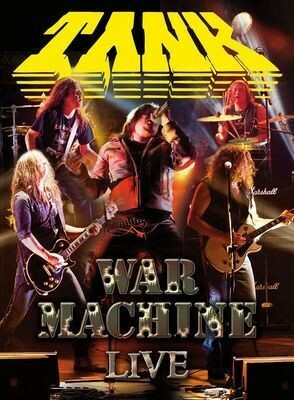 Named ‘War Machine Live’ after its 2010 CD release, old Tank songs are entwined with the new ones and the join is almost seamless. The band is undoubtedly classic rock and this is reinforced with the presence of Doogie White with his undisputed rock pedigree but there is still a slight punk edge in the mix. This comes over unsurprisingly more in the older Algie Ward-era tracks due mainly to their more simplistic song structure but it is there throughout all songs. Filmed at the Stodola Club, Warsaw on 9th March 2012 with a reasonable crowd in tow, the band plays pretty much 50% old and 50% new tracks. The predictable older tracks are there and my personal favourite ‘This Means War’ opens the set; classic tracks such as ‘Power Of The Hunter’ and ‘(He Fell In Love With A) Stormtrooper’ appear later on. The more complex and new songs, notably ‘Judgement Day’ and ‘Feast Of The Devil’ come over well and in context and there is no fanfare from Doogie about what song originates from his era or not. The pace is frenetic throughout and the energy remains through to the end, with the epic ‘The War Drags Ever On’. Regarding sound quality, the DVD comes with Dolby Digital 2.0 and 5.1 options and the sound is BIG. Bass player Chris Dale does well in the mix and his finger played lines are clear throughout. The twin guitar attack of Mick Tucker and Cliff Evans are as expected - clear, present and correct. Not being a drum expert, I can still vouch that the sound from the fast footwork of Steve Hopgood comes over well and of course Doogie´s voice has the quality that is expected. A great effort had been put into the camera work and some interestingly angles were used and overall clarity is pretty good. The DVD package is a card gatefold sleeve and comes over as high quality with some great photos of the band and of course the famous Tank logo. As for extras, there are a quite a few. First of all there is the video for the title track of the new album, ‘War Nation’, with its retro cartoon concept. Then, there are interviews with Tucker and Evans, mainly talking about the evolution of the band from the Algie Ward days to now. Their brief talk on the music had a great quote from Evans, “We plug our Les Pauls into the Marshalls with nothing in between”. This is then followed by an interview with Doogie White who is always good value. There is then a twenty five minute excerpt from the band’s performance at the Metal Hammer Festival in 2011. And that’s not all - the DVD also contains a ten minute life on the road film, photos, bios, discography and desktop screensavers.